One of the more colorful and well-known executives in the marijuana industry is handing over the reins of the Denver company he helped transform into an edibles powerhouse with national reach. Tripp Keber, the co-founder and CEO of Dixie Brands, resigned from the company Friday afternoon, effective immediately, to assume a new role in the marijuana industry. 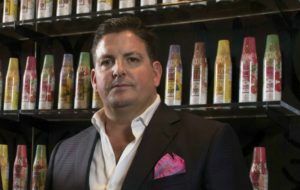 The resignation is part of a move that will partner Dixie with an upstart private equity company that is assembling a portfolio of infused products companies. New York-based Rose Capital, which launched this year, will provide the companies in its portfolio – including Dixie – with funding to expand their operations. Keber co-founded Dixie with Smith in 2010. Smith will serve as president and CEO going forward, Keber said. The company’s brands are available in four states and include MJ-infused beverages, chocolate bars, mints and CBD pet products. “Today really represents an exciting next chapter. I never would have considered doing this unless I knew that Dixie, my baby, was going to be left in good hands,” Keber said. Keber said he will be taking on a “leadership role” with BR Brands, a new Rose Capital affiliate that will launch in 2018 and assemble a portfolio of infused-products companies. In his new role at BR Brands, Keber will help identify potential companies for acquisition. Rose Capital is one of Dixie’s largest funding partners and is taking the lead on new investment to help Dixie expand nationally and overseas. For Dixie, Keber said, that’s akin to having a “rich uncle” that will be able to take his company to new heights within the global marijuana industry. “I move into a new role which is strategic to my over-arching goals, which is continuing to further brands within the industry. Dixie Brands is one of those portfolio companies within (BR Brands’ portfolio), where I’ll have a tremendous amount of influence,” Keber said. Keber emphasized that he will remain a majority shareholder in Dixie and its related entities and that he will also remain the sole license holder for Dixie’s infused products permits in Colorado. He’ll even still have an office at Dixie’s Colorado headquarters, he said. “You’ll still see me sporting the Dixie colors day in and day out,” Keber said. Keber dismissed what he called “rumors” circulating in the Colorado MJ industry Friday that he was forced out by the board or other Dixie stakeholders. Though the move may be bittersweet for Keber – at one point he described resigning as “terrifying” – he was jovial when discussing the changes. “Gone are the days that I have to worry about running a very large company,” he said with a laugh before noting he’s been a “serial entrepreneur” for his entire career. “The average length of one of my ventures has been between 30 and 36 months, and I’m now at my eighth year at Dixie,” Keber said. This is the second cannabis company from which Keber has resigned this week. On Tuesday, Keber and two others resigned from the board of directors of Denver-based MassRoots. Keber has been a pioneer in both the cannabis industry and more specifically in infused products. He was also one of the first edibles makers to focus on the importance of branding, and he brought the company to national prominence during his tenure as CEO. In 2012, Keber appeared on 60 Minutes in a nationally broadcast segment to discuss Dixie’s infused products business in Colorado. Currently, Dixie has a business presence in four states – Colorado, California, Nevada and Maryland – and is expecting to expand into more state markets in 2018. Dixie previously had products available in Arizona but decided to pull out of that market in August, citing a miscalculation on operating costs. The company also established an international CBD footprint under Keber’s leadership, with licensing deals in place in Australia and New Zealand, and the company is expecting to find a licensing partner in Canada before long as well, Keber said. Dixie…Nice little company…that loses money $$$$ what a joke.